There have been a few changes at Shades of Green, the military resort on the Disney World property. Over the past ten years, their machines have switched between the Attractions Tickets area and the arcade at Evergreens restaurant (at the back of the property, adjacent to the main swimming pool). 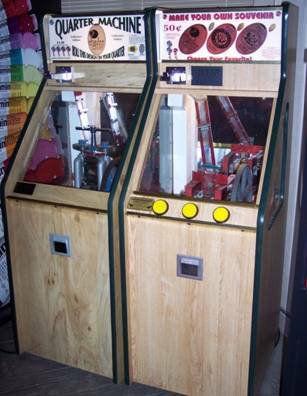 As of July 2012, the machines are back at the arcade. In addition, one of the penny machines is off stage. The quarter machine and the penny machine with the Shades of Green, Navy, and Army cents are still available. The quarter machine still costs only 75 cents plus your quarter – unique among the Disney World machines. September 1 2012 update: Despite a report that all 3 machines were available, only two machines are actually on-stage. March 2013 update: there are reports that all machines at Shades of Green have been removed.